A random compromised twitter account followed me today. This account has just been posting spam since 2014, but it made me think about an interesting idea. What if there were more mysteries on twitter? How could you signal to a person that this account is part of a game online, without forcefully providing the context of the game. If this account had said "part of 'Account Hunt 2016'", I might be interested in finding out what that is, but very possibly, I'd immediately think it wasn't real. 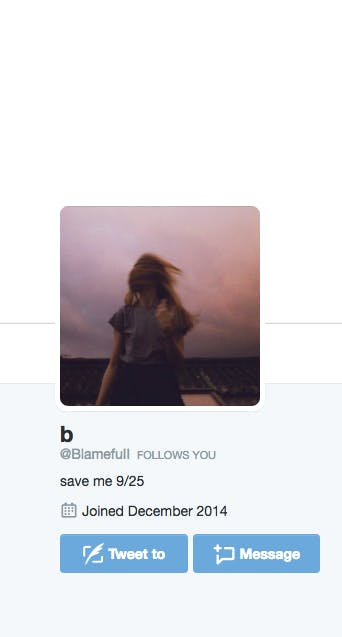 Instead this Twitter bio of "save me 9 / 25" implies that something is going on today. What if this accounts tweets lead you to a real place in the world? Or to a deep corner of the internet with more clues? Ok, I'm trying something. I've mentioned that I'm not reinstalling Twitter on my phone. So I've built a little Heroku App that emails you tweets from people you don't want to miss a tweet from. It runs once a day, and returns just plain text tweets with as little formatting as possible. More random sysadmin things as I continue my rewrite of my personal serving stack.